Hearth Inc. is one of Boston’s foremost operators of affordable supportive housing for at-risk elders. The City of Boston designated Hearth Inc. as the developer of 16 Ronald Street (former home to the Ronald Gibson School), which is located just steps from the MBTA Fairmont/Indigo Commuter Rail line. The proposed senior housing development is a four-level, wood frame construction building that will be known as Hearth at Four Corners and will provide 54 affordable, one-bedroom apartments and 2 studio apartments with an array of capital facilities and resident services designed to enable Boston’s elders to maintain an independent lifestyle as they age in place. Designed to meet LEED standards. DREAM Collaborative has partnered with Dorchester Bay Economic Development Corporation to develop a new three-story 17,100 sf mixed-use commercial building to knit together the amenities surrounding the Dudley Miller Park site and engage with the Dudley corridor neighborhood. 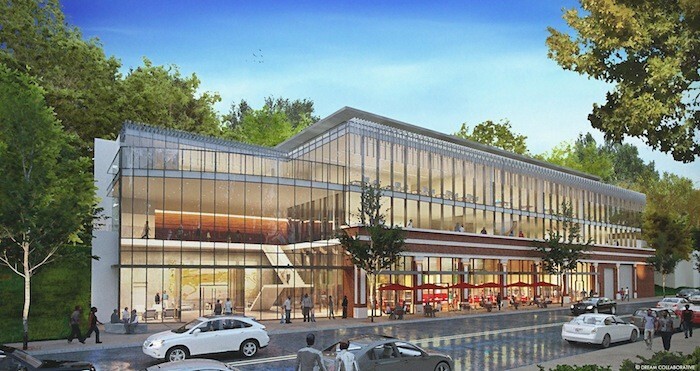 The design provides flexible interior programming for multiple mission-driven office tenants, street level retail space intended for a sit-down restaurant or cafe, surface parking, and options for connecting the new building to The Food Project* greenhouses adjacent at the rear of the site. A photovoltaic array is an important part of the building’s architectural expression and contributes to the project goal of LEED Gold standards. Other major sustainable design features include a green roof, gray water collection and re-use, bicycle storage and shower facilities, and high efficiency systems. Connection to The Food Project greenhouses with farmers market in surface parking area. *The mission of The Food Project is to create a thoughtful and productive community of youth and adults from diverse backgrounds who work together to build a sustainable food system. Our community produces healthy food for residents of the city and suburbs, provides youth leadership opportunities, and inspires and supports others to create change in their own communities. Representatives from DREAM Collaborative and Janey Construction joined Mayor Martin J. Walsh to celebrate the ground breaking for Freedom House’s new community center headquarters. The project transforms the single-story, 8,440 sf Grove Hall Library building at 5 Crawford Street in Dorchester with an interior fit-out including office, technology lab, and teaching spaces, as well as envelope and roof repairs to the existing structure. The new facility will meet LEED standards for certification including high energy efficiency systems and materials, resulting in significantly reduced operating costs. Freedom House is a non-profit organization that provides youth programs aimed at transforming the economic and cultural fabric of high-need communities through education and leadership development. Read more about the ground breaking at Freedom House at the City of Boston’s web site. A rendering of the new facility can be seen here. Dream Collaborative has kicked off a new partnership with Madision Park Development Corporation (MPDC) of Roxbury. The project at 2451 Washington Street consists of a 21-unit multifamily condominium building, supported by 23 surface parking spaces, and 6 townhouse condominium units with garage parking included in the unit. These two parts of the development will be connected by landscaped open space and garden areas. The project will bring job and home ownership opportunities for the community and will contribute to the continued revitalization of the Dudley Square neighborhood. MPDC’s mission is to develop and preserve quality, mixed-income housing in Roxbury, and to promote the renaissance of Dudley Square as a thriving neighborhood business district, recognized as a center of commerce and culture that anchors the economic revitalization of Roxbury. DREAM Collaborative is proud to play a role in this important work. On Wednesday, December 9th DREAM Collaborative celebrated the season with an open house and networking event in our new, larger office space. Thank you to all of our colleagues, clients, and friends who attended and made the evening a success. A special thanks also to City Councilor Tito Jackson for joining us and for the inspirational words. We look forward to another year of engaging urban redevelopment work in 2016. Happy holidays and cheers to a wonderful new year ahead! DREAM Collaborative principal, Gregory Minott, will be one of the featured speakers at the 2015 Supplier Diversity Best Practices Forum at Fenway Park on Wednesday, November 18th from 8am to 12 noon. Presented by the Boston MBDA Business Center, GNEMSDC, and the Center for Women & Enterprise, the purpose of the 7th Annual event is two-fold: (1) provide tools and resources for women and minority-owned firms to grow their businesses, and (2) provide the necessary information for public and private sector leaders to implement or enhance their organization’s supplier diversity program. Speakers include: Ronald Walker (Secretary of Labor, Commonwealth of Massachusetts), Raul Suarez-Rodriguez (CVS Health), Tatiana Paredes (St. Francis Hospital & Medical Center), Gregory Minott (DREAM Collaborative), Jennie Peterson (Wynn MA, LLC), Roy Pederson (Jacobs), Reggie Nunnally (Massachusetts Diversity Coalition) & others! DREAM Collaborative is pleased to announce a new project! We will be joining forces with Stantec / ADD Inc. to replace 1,100 units of housing in Charlestown with up to 3,000 units of mixed-income residential, including 600 units of elderly housing. The clients for the project are Corcoran Jennison and the national developer SunCal. See our Portfolio for the latest project information as well as this Boston Globe article. DREAM Collaborative recently completed the feasibility study for the Innovation Center at 260 Washington Street. We are thrilled to be working with Jhana Senxian and TSNE on this exciting project. The article below appeared on the website of UMass Boston’s Venture Development Center. Bringing innovation to Boston’s inner city neighborhoods means different things to different people. In Dudley (http://roxburyinnovationcenter.org) it means tech. In Uphams it’s cultural. And now in Dorchester’s Four Corners neighborhood (http://sustainabilityguild.com/building-the-future/) it means mission-driven businesses that leverage community based skills, energy and ingenuity. If all goes well, 2017 will see the opening of 260 Washington Street, a community-designed and led venue that manifests a visionary approach to asset creation featuring dynamic businesses and initiatives that collectively address the most entrenched challenges — and exciting opportunities — facing cities today/our city. Jhana Senxian is the Founder and CEO of the Sustainability Guild, a direct action network of urban residents who re-imagine and redevelop their communities. Jhana is a social anthropologist and entrepreneur who hails from Boston’s Grove Hall community. She’s actively changing the systems which lead to social problems in the urban core. She spent a year at the VDC developing her Vision-in-Action concept which has resulted in a partnership with Third Sector New England, a non-profit sector capacity builder with a pattern of putting its resources and experience behind shifting power and supporting social justice work. The co-development team joined forces to acquire and transform the warehouse building at 260 Washington Street into a 70,000 sf showcase of social enterprise. In addition to the building development, the plan includes the transition of a +42,000 sf urban wild into the Washington Street Food Forest. The green oasis and vibrant destination reflective of community needs and desires, is sure to shift the conversations around local economies, resilience and innovation. Located just a five minute walk from the new Four Corners/Geneva MBTA station along the Fairmount/Indigo Corridor, the hope is that the building will serve not only as a catalyst for the revitalization of the Washington Street Corridor but also as a scalable and replicable model for community leadership, asset creation and investment that shifts paradigms of power, access and cross-sector partnership. Q: When will the space open? Weaving together the ideas, capital and the community to make this a reality is no small feat — but the enthusiastic response has been phenomenal. Our goal is to have over 85% of the businesses owned and led by people of color from our inner city neighborhoods. We want the project itself — at all levels — to model that vision of community voice and leadership. This will mean a different kind of alliance creation and take serious investment in capacity building and making certain that we have absolutely aligned missions amongst the partners. Our partnership with TSNE models this with their investment in a pretty radical vision of shifting power by putting their resources and rallying their network and peers behind this kind of direct action and investment in this project and in the Guild itself. We have a very aggressive desired timeline to open in late 2017 and we know that this is super optimistic – but that’s what this project is all about. Q: What kind of businesses do you envision? First and foremost, this venue will showcase businesses that cumulatively make up a dynamic food hub. From a worker and community owned food coop, cultural farm-to-table restaurants, and healthy cafes – to a rooftop farm, aggregation and distribution service, and robust programming connected to the 1 acre food forest, we will get to incubate the very best ideas around healthy, delicious eating along the whole food supply chain. Next, the building itself will not only be an example of green building/clean energy tech demonstration — but also a site for green infrastructure learning, training and business development. We are currently working on some very exciting pilots to deliver the very best quality food in truly accessible and responsive ways – while creating community-led businesses along the way. Additionally, we will have over 10,000 sf of space dedicated to wellness, healing and cultural businesses. The space will host a 300-500 seat performance venue as well as be an exhibition space for art. Our community partners are bringing extremely interesting business concepts to the table that address diverse aspects of health, creative expression and social connection. There will also be over 14,000 sf of office and co-working space — and we are working on getting some long needed retail banking services into the building, as well. In all, there will be over 17,000 sf of event and educational space so that every element of the building has the opportunity to expose folks to new knowledge, culture and skill sharing. Q: Why is your vision of innovation best for the neighborhood? Because it is not my vision alone. Everything we do at the Guild is the result of collective community voice, talent, interest and action. This brick and mortar project is an extension of the very same process and experience that we enact across all of our work. We start with the absolute belief in the beauty, strength and talent within our community. We choose to be powered by that beauty, strength and talent and that leads the vision and action of our cross-sector partnerships. Therefore, who designs, who builds — who feels ownership of a project and experience such as this, matters as much aswhat we are trying to build. This is what we mean by holistic and culturally integrated Vision-in-Action — and this is key. We know from our experience on the ground and from market studies that our neighbors would love to spend their time and money on socio-culturally positive amenities and experiences in their community that have the ability to elevate not only quality of life but also social consciousness and connection. Q: Did your experience at the VDC influence your vision? My experience at the VDC was extremely positive because I was introduced to an ecosystem of supportive peers and mentors who genuinely understood why the status quo conversations about innovation across our city and region left me deeply unsatisfied and passionate to explore other approaches. Folks at the VDC recognized that the Vision-in-Action work was my passion and as a result, I found the courage — and enthusiastic support — to drastically shift direction, follow my instincts and leverage my experience to create my own path and approach for positive impact. Too often city driven innovation focuses on pleasing a narrow demographic of technology workers. Enlivening a city’s brand this way is tempting, but energizing its entire population by focusing on neighborhood stabilization, investing in community leadership and investing in social enterprise and local asset creation, is even better. Keep an eye on 260 Washington Street because that’s the vision. And knowing Jhana, it will be transformative for current residents, the neighborhood and a model for our city — and others.